I can picture myself stricken with consumption, washed up on the pillows, pale but radiant with fever--can picture myself handed a cool, tall glass of eggnog. My pale thin fingers slip on the glass, but yet I raise it to my lips, and sip, eyes lidded with weakness. And as that silken custard touches my tongue, the luster returns to my hair and the pink blooms again in my fingertips. "Lissie," I say, "lace up my stays. I'm going to the Christmas ball tonight." This is homemade eggnog, an unpasteurized festival of nutmeg-scented rum-rich cream. I wish I could drink nothing but eggnog from snowy dawn to early dusk, and all the long night through. But if I did, my skin would be so creamy, my eyes so bright and dewey, my hair so lush and wavy, that I'd have to dance with every man at the Christmas ball, and wear out my shoes with dancing. And I like my shoes. Also the hens and gentle cows can barely keep up with me as it is. This will make you a quart of eggnog. Since the eggs and milk are raw, I would not recommend making it with anything but eggs from the healthiest chickens. The golden yolks of those eggs will give it a creamy yellow hue and a richer, deeper flavor. If you only have access to storebought milk and eggs, make a cooked eggnog, or use lots of liquor to kill off bad bacteria. And the good bacteria in raw milk from healthy cows will actually kill off bad bacteria, should anything clinging to the shell of the egg find a way into the nog. 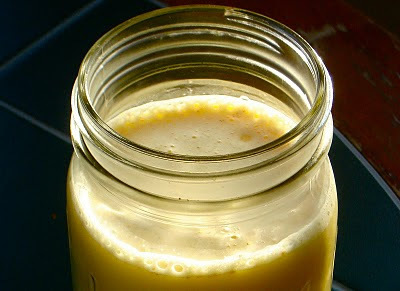 If you decide to drink eggnog daily, I would recommend using just six egg yolks instead of four whole eggs. Raw egg whites have a substance that causes biotin deficiency in the long term. Beat four eggs thoroughly. Add three tablespoons of maple syrup and a tiny pinch of salt and beat well. Add some liquor--rum, brandy, bourbon--according to your taste. A few tablespoons will give you some flavor; a cup or more will give you a heady nog. Beat well. Add three cups very rich raw milk, beat well. Grate nutmeg over it to taste. Chill for a few hours to meld the flavors. eggnog recipe without fresh eggs? maybe cook them someway? Instead of rich milk, use half and half. Separate the eggs. Beat the yolks with half the sweetener until quite creamy. Clean the beater. Start heating the half and half over medium heat, stirring frequently. As it heats, doubletask: beat the whites until they form soft peaks. When the milk is about to simmer, remove it from the heat. Pour half of it into the egg yolks, whisking them briskly. When the egg yolks and milk are well mixed, pour them back into the pot of milk, and whisk briskly again. Put over medium heat again, stirring constantly, just until the eggs thicken slightly and the mixture coats your spoon (do NOT boil). Stir in the egg whites thoroughly, then remove from the heat and let it cool before adding the spirits and nutmeg. Even this method may not kill all the bacteria, but it's a pretty good bet. You used to have a recipe with 3 whole eggs and 3 eggs yolks, etc...what happened to that? It was my FAV! !